I’m going to Africa. No joke. I’m going on a safari with my family to South Africa, Botswana, and Zimbabwe. This is a once in a lifetime opportunity that I have been looking forward to this since the second I was invited to go along, and now it’s just two weeks away. I am going to take my audio recorder and video camera and collect lots of material. I’m not sure what I’ll do with it yet, but with my recent interest in site-specific sounds and soundscape, I am positive I will compose something. It’s hard to speculate, I’m just very excited about the trip at this point. This semester, I have been trying to eek out time to work on my piece Icons, for T.V. Buddha Ensemble in Champaign, Illinois. It’s getting there… I should have a double bar line very soon. 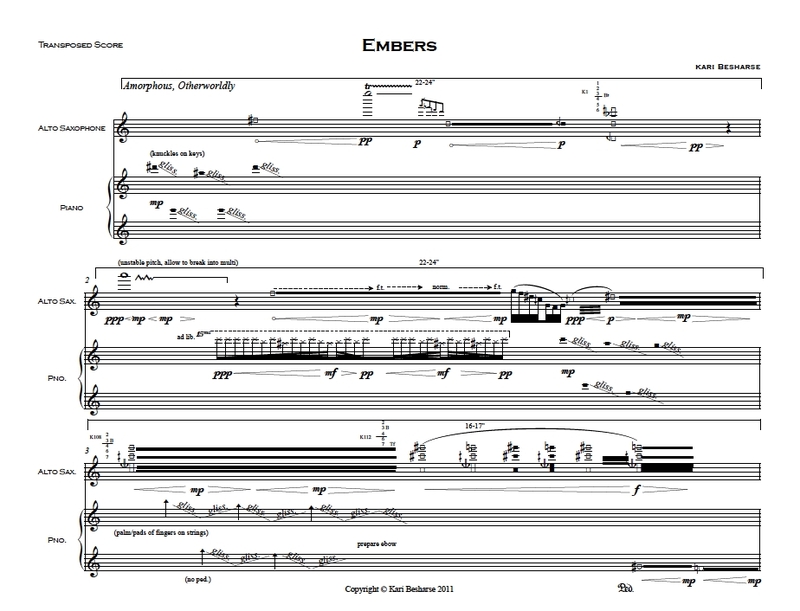 Today I finally finished editing the score and instructions for Embers, my piece for saxophone and piano. Categories: Acoustic Music, Africa, Saxophone, Teaching | Permalink.